P/2008 O2 (McNaught) discovered by R. H. McNaught (Siding Spring) on July, 28 2008. (410928) Maidbronn discovered by B. Häusler (Maidbronn) on September, 28 2009. 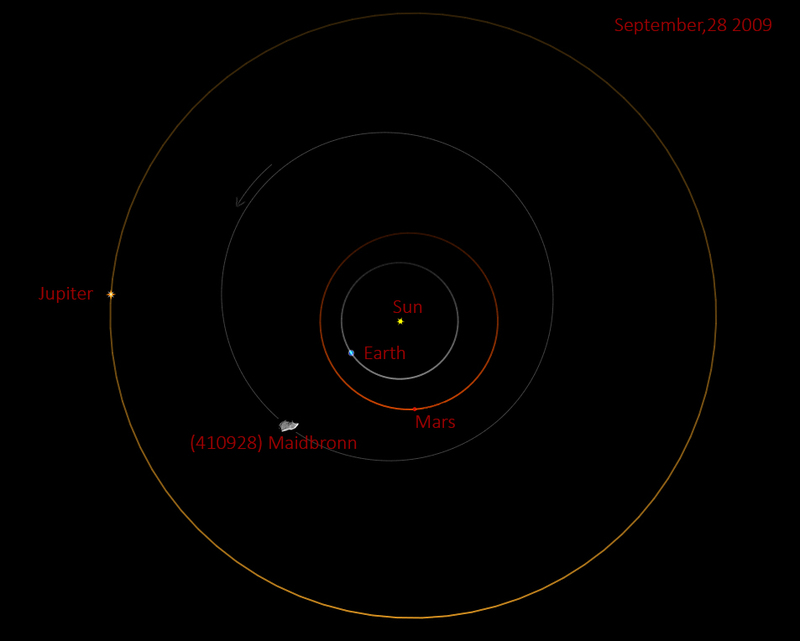 The theoretical diameter of asteroid Maidbronn is from 0.7 to 3.8 km, depending on the nature of the body. The orbit in the outer asteroid belt indicates Maidbronn one of the C-type asteroids, whose main component is carbon. Thus, one can expect that the diameter of Maidbronn is between 2 and 3 km and the body has a potato-shaped structure. Orbit situation on the day of discovery.